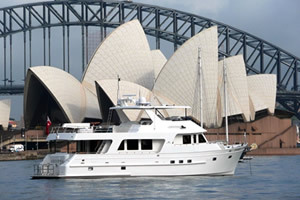 Aroona is a 70ft Outer Reef motoryacht launched in 2010, designed for luxury, comfort and relaxation. She is based in Cairns in tropical far north Queensland and skippered by Eye to Eye's former employee (skipper, engineer and chef), adventurer and longtime friend Ross Miller. Aroona has been designed for optimum space, comfort and smooth travelling. She has accommodation for up to 7 guests in three state rooms all with ensuites: master suite (2 guests), VIP suite (2 guests) and guest room (3 guests) and offers spacious living area spread over three decks. With the privacy of your own boat, fine food, choice of activities/destinations and a brilliant skipper, Aroona is guaranteed to provide you with an unforgettable adventure. Equipped with everything you will need for a day of relaxation, an overnight stay on the water or a longer adventure around the islands of tropical North Queensland. With four luxury staterooms, your comfort is their priority. Each room offers air-conditioning and private ensuites with the king stateroom boasting its own spa bath. With an additional two spacious queen rooms and a twin room, M.Y. Flying Fish accommodates up to eight indulged guests for overnight charters. 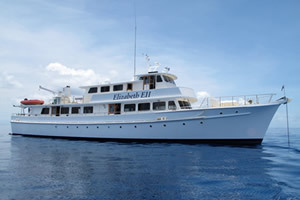 The 108ft Elizabeth E II, built by Norman R Wright, has a cruising range of 1500 nautical miles and is fully equipped for extended trips with up to 26 guests. There are 12 air-conditioned and ensuited cabins on the Elizabeth E II with fully catered dining and bar facilities available on board. The EEII is professionally crewed and fitted out for diving, cruising and exploration throughout the Great Barrier Reef and the Coral Sea. With a reputation for serving meals of the highest quality and crew trained to offer a high level of service this vessel is well equipped to make your time on board memorable. 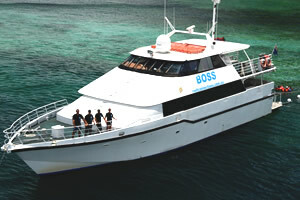 The BOSS is a 25meter Alloy long range charter vessel built new in Cairns in 2004. It has a cruising speed of 10knots and a range of 2900nm. 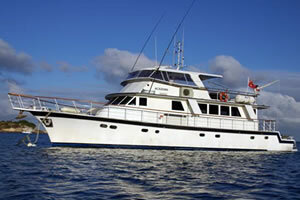 She is fully equipped for long range comfortable charter for up to 21 pax. She is in current 1B and 1C survey for 25pax and 1D survey for 94pax. The BOSS has 10 cabins an enormous saloon and bar area. Sit back with a glass of vino and relax in fully air conditioned comfort while our 5 star onboard chef prepares you a meal you will not forget. All linen towels are provided, full guest washing service is complimentary. 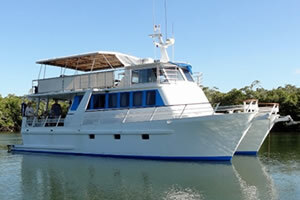 The BOSS is professionally crewed and fitted out for diving, cruising, research, filming, and exploration anywhere on the Great Barrier Reef and in the Coral Sea. With an enviable reputation for delivering the highest quality charter available. Let our trained crew show you the difference. Customised charters are our specialty we will go out of our way to make your experience a memorable one or your next one is free. M.V Eclipse D is a well appointed, fully air-conditioned, comfortable 16m x 6.3m Aluminium Catamaran capable of extended live aboard charters for up to 9 passengers and 4 crew. There are 2 large airy double cabins and 4 twin share cabins, two bathrooms - both with its own shower/household toilet. The main living area includes a large open plan galley, saloon area which has entertainment facilities such as a Flatscreen TV, DVD, Ipod and music station. Freedom IV is a new aluminium power cat with a good cruising speed and a long range with very comfortable luxury living quarters. She is stable with a wide beam, a large working cockpit, three large dive platforms low to the water, ideally suited for film and dive work. Her skipper Ben Cropp, is highly experienced. He has dived the Great Barrier Reef for 55 years and knows the Australian Coast and off shore waters better than most. 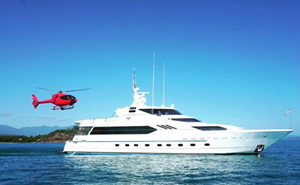 Phoenix offers 60 ft of elegant and seaworthy air-conditioned comfort. The saloon is spacious and complete with a cocktail bar. 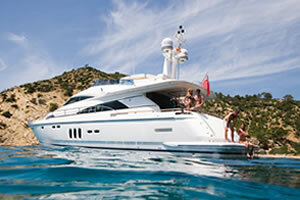 Large aft cabin with ensuite bath/shower plus two multishare cabins with bathrooms. For the ultimate reef experience relax and dine under the stars on the well-designed fly bridge. 100% locally owned and operated. Enterprise - this 68' Squadron Fairline combines power & sophistication to deliver you into the world of ultimate luxury cruising. The majestic lines of Enterprise conceal a wild heart & potential to thrill, her elegant profile transform into a sleek blur on the water. Snorkel, cruise, scuba dive, explore or simply just relax. 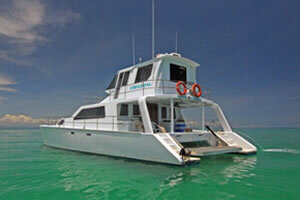 Enterprise Charters is Ecotourism Certified & proudly Australian owned.